We all have read or heard of the studies and reports that indicate that 50-75% of all leads are lost or are not followed up effectively. But Why? A big part of the problem is that historically there has been a fundamental mismatch between the buyer's “buying process” and the seller's “selling process”. The mismatch is not unique to the Home Building Industry but it is relevant, and may be even more pronounced, for builders and developers because of traditional approaches to marketing & selling. oday have increasingly gained control and more than ever before this learning and due diligence is being done online via the internet. Learning involves getting educated and gathering information and they will also do some of their own due diligence with financing approvals and such. Then, as leads become prospects and come closer to selection, they will visit model homes or presentation centers to determine the best community and best home option for them. The Builder's sales representative has a selling process too. 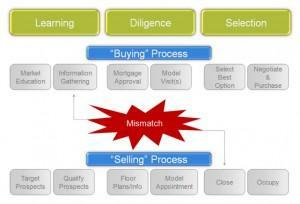 But here is the mismatch, the prospective buyer is often in the early stages of their buying process, still gathering information via an online registration (or perhaps even a walk in to the model or sales center) but when the sales professional gets an online registration or visit it is all about closing the deal. Sales people, quite naturally gravitate to those leads that are sales-ready (ready, willing & able to buy now). Most sales people are not thinking about long-term nurturing or cultivation of leads through an extended buying process because we typically compensate, measure and reward sales people on one thing – closing the deal. Unfortunately, in current market conditions, only a small percentage of prospects are ready to be closed — what we call sales-ready. The great majority of prospective buyers today have less sense of urgency, have more alternatives and have a much longer buying cycle – why not call these marketing-ready? If more leaders and managers will think strategically of lead generation and follow up in these broader terms – SALES-READY OR MARKETING-READY (rather than just A, B, or C’s) they can begin to build a blueprint of distinct selling processes for these different categories of leads and prospects. Not only will the mismatch begin to disappear you will get more sales in the long run with higher close rates and a much better return on your marketing investment.